Personal Injury Attorney – Jorge P. Gutierrez Jr. Personal injury claims are justified when individuals suffer preventable injuries due to the negligence of others. Personal injury and wrongful death cases can result from accidents and safety issues in virtually any environment, including workplaces and in entire communities. Many thousands of people suffer from preventable injuries every year. Jorge P. Gutierrez Jr., Founder of The Gutierrez Firm, is a Florida Bar Board Certified Civil Trial Lawyer providing legal services and expertise at the highest level. Attorney Gutierrez is known for success in representing clients for maximum compensation. If you have a personal injury case, Attorney Gutierrez will speak with you personally to help you determine what your best option is. Automobile Accidents – Thousands of deaths and serious injuries continuously occur as a result of car, truck, and motorcycle collisions. We represent clients in personal injury cases involving automobile accidents, including those involving pedestrians and bicycles. Wrongful Death – If your loved one died as a result of someone else’s negligence, you may be entitled to compensation. Contact us today regarding a wrongful death personal injury claim. Surgical errors are mistakes made during surgical operations. These mistakes involve damaging organs, nerves or muscles; leaving surgical supplies inside the patient’s body; and operating on the incorrect part of the patient’s body. Injuries to the brain and spinal cord frequently result in paralysis and cognitive impairment. Attorney Gutierrez and his firm work to recover compensation for clients suffering from these kinds of personal injuries. If a birth injury occurs as a result of the negligence of a healthcare provider, a personal injury claim can be made. Common birth injury negligence cases involve Asphyxia, Erb’s Palsy, Cerebral Palsy, and Caesarean Sections. Hospital personnel have a responsibility to properly monitor a patient’s condition and prescribe and administer proper prescription drugs. If any of these vital steps are handled negligently, the outcome can be serious or deadly. If medical personnel fail to properly diagnose an event or medical condition, the result can be delays in treatment that lead to death. For example, if heart attacks, cancer, or aortic aneurysms are negligently assessed, a person can die due to lack of life-saving medical treatment. Maternal-Fetal Medicine, Neurology, Obstetrics and Gynecology, Ophthalmology, Orthopedic Surgery., Pediatrics, Plastic Surgery, Podiatry, Radiology, Surgery and Urology. Property owners have a duty to ensure that their property is accessible and safe for visitors. 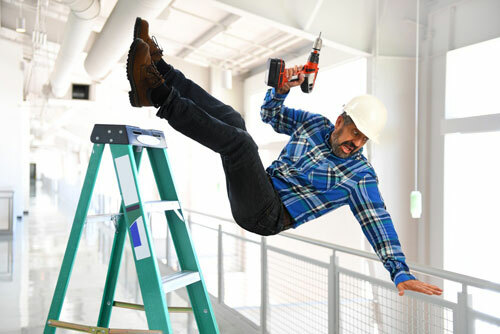 If slip and falls, which are common injuries, occur as a result of negligence, the property owner can be held liable. You may be able to recover compensatory and punitive damages if you’ve been injured at a private home, public event, or commercial business. Has someone else’s negligence caused you or a loved one personal injury? Contact Attorney Jorge P. Gutierrez Jr. today for dedicated, quality, efficient representation.